A beautiful Federation waterfront property with direct access to the delightful Clarence Walking Trail, Karinya offers guests a self-contained two bedroom apartment with magnificent views of Geilston Bay. Light and airy with a real sense of style and space, this apartment has been tastefully furnished with original artworks and oriental rugs providing that extra touch of class and comfort. Add to that luxurious bed linen, reverse cycle air-conditioning and off street parking for two vehicles… Karinya is the perfect place to base yourself when visiting Hobart - your home away from home. Your accommodation includes the entire ground floor of this imposing property. It offers a private entrance to a spacious open plan living room with dining area and fully equipped kitchenette. There are two large queen bedrooms that both have an ensuite, and there is secure off-street parking for two vehicles. Only 10 minutes from Salamanca and an easy drive to Mona, Richmond and Port Arthur, Karinya is a haven of peace after a busy day’s sightseeing. 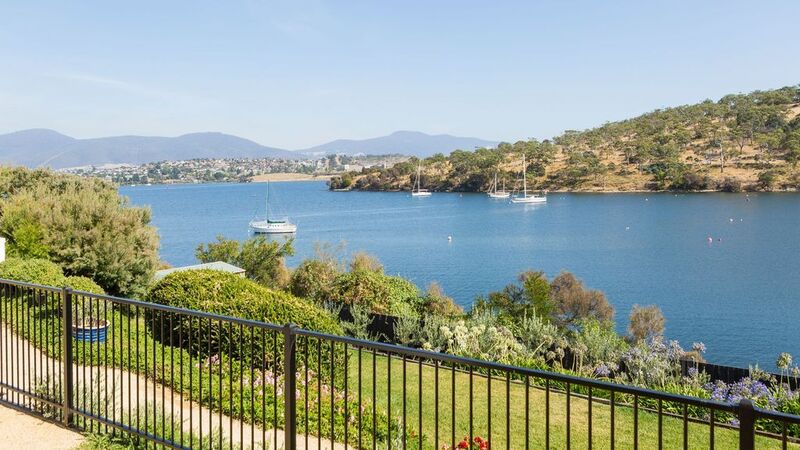 Sit back with a glass of wine enjoying the gentle lapping of the river Derwent as you watch the yachts bobbing on their moorings, or take a stroll along the water’s edge on the delightful Clarence Walking Trail. Karinya has a special ambience that is bound to impress. As Karinya is a perfect getaway for adults and is not suitable for children under 10 years of age. We were extremely happy with the location and the stunning views. The rooms and bathrooms were lovely with ample room and very clean. The kitchen provisions were a little disappointing. We arrived on the 28th of February (the last day of the month) and the milk in the fridge had a useby date of 1st March (our stay was for four nights). We listed four guests as being in the accommodation, but there were not even enough coffee pods for us to have one coffee each per day. I would suggest the owner invests in a couple of descent mattresses as both couples complained that they were very uncomfortable and we all had sore backs. In summary, the location was definitely the highlight with excellent access to walking tracks along the waters edge. The property was very clean and very well styled. All the creature comforts of home but with a spectacular views. We loved our stay at Karynia and would highly recommend it.